Construction of this bridge started in April 1962, after obtaining approval from President Sukarno. Construction costs were taken from Japan’s war reparation funds. Not only the cost, even this bridge using experts from those countries. Bridge dedication was made in 1965, and also reinforced the Bung Karno name as the name of the bridge. At that time, this bridge is the longest bridge in South East Asia. 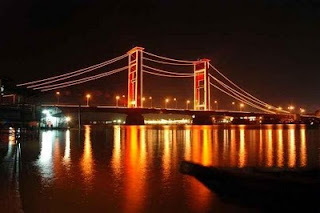 After political upheaval in 1966, when the anti-Sukarno very strong, the bridge’s name was changed to the Ampera bridge (Amanat Penderitaan Rakyat or People’s Mandate Suffering in English). For a few years after it was opened, the center span could be lifted at 10 meters per second to allow ships of up to 44.5m in height to pass underneath. However this only occurred a few times, and after 1970 it could no longer be opened. The official reason for this was that the 30 minutes needed to raise the bridge was causing unacceptable delays, and that in any case silting of the river had made it impassable for large ships. However, said architect Wiratman who acted as a consultant before the construction, the design of the bridge was flawed from the outset because of the soft mud on which it was built. He maintains that his concerns were ignored for political reasons, and that as the towers' foundations shifted, the bridge deformed to the extent that it could no longer be opened. The ballast weights needed to balance the weight of the bridge were removed in 1990 to prevent possible accidents were they to fall.